In a recent event, the peace of two of the mosques in New Zealand in Christchurch got shattered when a gunman busted in and opened fire with semi-automatic weapons just after the worshippers had gathered to offer Friday (Jummah) prayers. This shocking act of violence that left 50 people dead and many injured has caused outrage across the world. 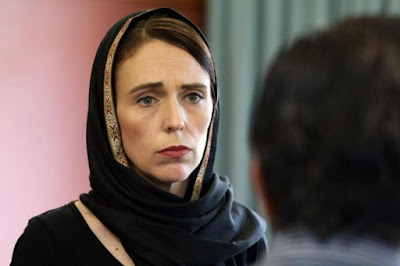 From the country’s capital Wellington to Christchurch, she led a multiparty delegation, donning a black headscarf and mourned with the relatives and friends of the victims. She has come up as a remarkable leader; she not only banned the assault weapons after the incident but also offered financial assistance to the victims of the families. Not only this, Jacinda Ardern decried the white-nationalist ideology that actually fueled the massacre but also spoke firmly of what she believes her country’s values are. She has provided the world with her own stamp of leadership. Being a young leader, she has shown how compassionate a leader can be when needed and gutsy when the situation calls for it. She actually delivered when her country was in need of a leader. Just 48 hours after the incident, she opened the parliament session with ‘Assalaam Alaikum‘. It is very important that as a leader you remain authentic, passionate, and even emotional. You need to be authentic with your values and beliefs. It is important to share your vision and live your values because it makes you more engaging and inspiring for others. Being a leader does not mean that you are the smartest person. In the recent event, Jacinda Ardern showed how a leader can get affected by the situation around. She didn’t respond without having a complete understanding of what happened and then made a public appearance. Jacinda Ardern proved that just speaking about something that is right or wrong, is not enough. As a great leader, you need to make an effort to help people who are in need. The Prime Minister not only condemned the attack but also showed her commitment to doing the right thing as opposed to toeing the political line. She embraced the victims as New Zealanders, dismissed the shooter as not one of them, announced reforms to gun laws as well as announced financial aid to the families of the victims. Another lesson that can be learned with the response of Jacinda Ardern in recent attack is that a leader needs to be open-minded, be open to different cultures, and should be able to make an honest attempt to understand the needs and aspirations of the people around.